Author: Svenja Haberecht. Photographs by: Svenja Haberecht. Series edited by: Thomas Bierschenk, Heike Drotbohm, Raimund Kastenholz, Matthias Krings, Carola Lentz, Anja Oed, Markus Verne. In 2010 Burkina Faso celebrated his fiftieth independence jubilee – a milestone in the process of nation building. The anniversary celebration gave rise to memorize the country’s history and proudly to take stock of previous achievements. But it also raised a discussion about the status quo of independence, recent challenges and future development paths. 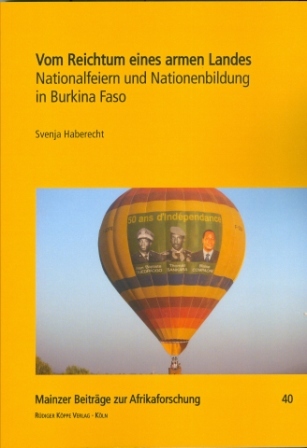 The present book examines the process of nation building in Burkina Faso along the history of its national days since 1960. Based on comprehensive archive material concerning past celebrations of national days, participatory observation and numerous interviews about the anniversary celebration of 2010, the author analyses the political staging as well as the social counterdrafts of nation. The examined anniversary celebrations demonstrate that in between the five decades of independence a national consciousness emerged, which – in full consciousness of the country's material poverty – imposes its cultural diversity as the nation's wealth. Svenja Haberecht studied Sociology at the University of Bielefeld. She received her PhD at the Institute for Anthropology and African Studies of the Johannes Gutenberg University Mainz and was a member of the doctoral research group The poetics and politics of national commem­oration in Africa. Research areas are Asia (Sri Lanka, Laos) and West Africa (Burkina Faso); her research interests are development planning and development politics as well as political anthro­pology and nationalism.